Susan G Komen for the Cure is the world’s largest grassroots network of breast cancer survivors and activists fighting to save lives. Pretzel Crisps are the world’s first spreadable pretzel crackers made without any trans fats, saturated fat or cholesterol. For over 25 years, Susan G. Komen for the Cure® has been the global leader of the breast cancer movement, having invested more than $1.9 billion since inception. Through the generosity and donations of individuals and companies across the country and throughout the world, Komen for the Cure has been able to continue its fight against breast cancer and towards finding a cure. This year, Pretzel Crisps®, the low-fat, low-calorie flat-baked pretzel cracker, is proud to join the fight and help donate to the cause. For every specially marked 14 ounce Pretzel Crisps® bag sold from August through October 2011, Snack Factory will donate a portion of the proceeds, with a minimum of $100,000, to Komen. 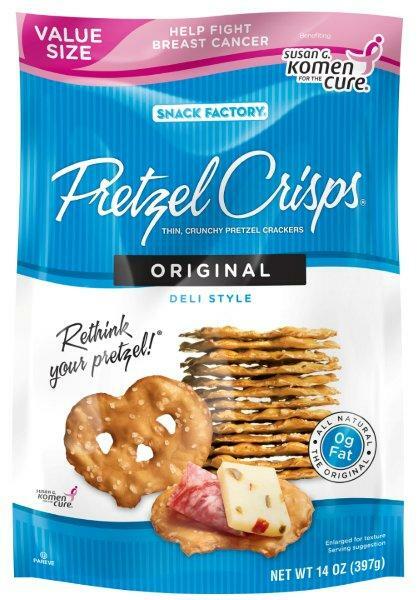 Look for the Pretzel Crisps bags with this special Susan G Komen label at the top! Is there any thing better than when your favorite snack food teams up with a great cause? I think this is the stuff us food/lifestyle bloggers dream about! Now, there is a blogger contest (w/ an amazing travel prize, btw) going on in conjunction with the Susan G Komen partnership. But, I decided not to write about that portion of the program. It does center around getting comments on your blog, but I think that would distract from the point of this whole thing. I would prefer to center this blog post on a great partnership and a super simple way for you to support an amazing cause while you munch on an amazing snack food! You can additional ways to donate to the organization and learn how to get involved in events and races in your community by logging onto www.komen.org. 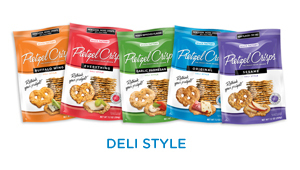 PS – Tie-ins like this are why I love Pretzel Crisps so much. They really “get” what we want out of a wholesome food company. If they ever turn into a company that acts like a “BIG company,” I will be sad….Just FYI. This entry was posted in Random, Travel in New England and tagged blog, blogger, charity, healthy snack, philanthropy, pretzel crisps, susan g koman by reneeh. Bookmark the permalink. those are one of my favorite snacks!